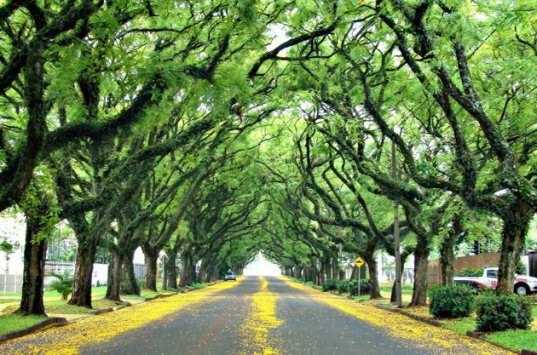 In the Brazilian city of Porto Alegre lies the 500 meter stretch of Rua Gonçalo de Carvalho - an amazing tree-lined avenue that may well be the most beautiful street in the world. Towering Tipuana trees line both sides of the road, creating an incredible green archway that looks like a mythical forest. It's amazing that this verdant space is actually three blocks in the middle of a modern city! 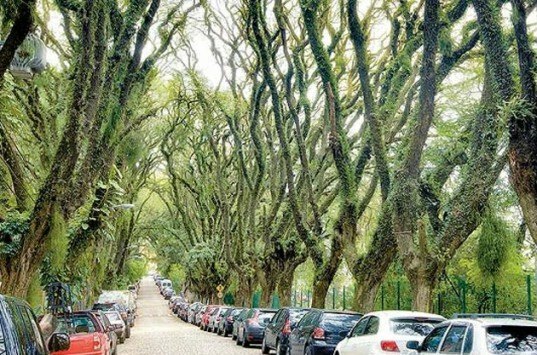 The Tipuana trees along Rua Gonçalo de Carvalho were planted in the 1930’s and they have grown into a shady neighborhood canopy for the past 70 years. In 2005, construction of a mall in the area threatened the destruction of the trees. Residents protested, and they were successful in lobbying mayor José Fogaça to declare the area a cultural site that has to be preserved. The trees on Rua Gonçalo de Carvalho create a dense shaded area. From above, it looks as if a forest has filled in between all of the neighboring buildings. Tipuana trees, also known as Rosewood, are native to South America and can grow to be upwards of 100 feet tall. Their extensive root systems can be known to damage streets, sidewalks and nearby homes, but special trenching can prevent this. When in bloom, they have lovely yellow flowers. This is a gorgeous street. The only things that ruin it are the lines of parked cars. The city should really capitalize on the beauty of this street by making it an auto-free zone. Imagine pedestrians, cyclists, ecotours. I can also envision some wildlife. Monkeys, tropical birds. This should be the city green. Wow, what a wonderful sight, even just viewing the images, what I can say, good on you community for protecting the tress. I was wondering if someone already done the research of how many unseen species living on the trees and how much CO2 that the trees are absorbing and the valuable contribution on each individual trees provide to the community. Its a testament that, as a human being we can achieved many things, somehow we just narrow minded with our thinking and we don't think about the value, protecting and preserving the only planet we live in. Aren't these urban tree assets and their canopy marvelous, verdant and robust. Seeing these trees from photos and a distant view is one thing. Yet a close up assessment of individual tree health may bring to view an entirely different story. Large established irreplaceable urban trees don't exist for the long-term by themselves. By inhabiting areas of dense human populations requires individual tree management strategy based on the "Art & Science of Arboriculture"- too often absent and excluded from many municipalities charged with managing urban trees. 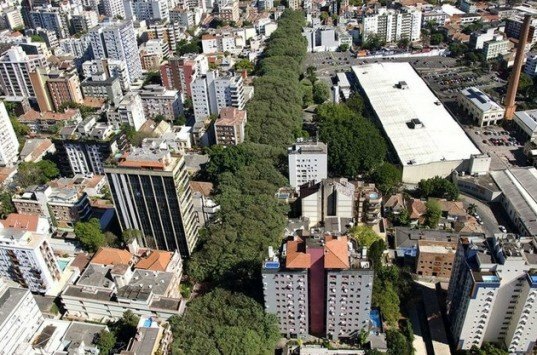 Perhaps Porto Allegre is unique in its funding for urban tree management and the trained / skilled arborists that practice arboriculture and not forestry. Are these trees then protected? And what protocols exist that protect them from the hard infrastructure ever imposing upon them. I personally am not the hugest fan. I agree more roads should be like this with the regional variety of tree, but I think the main roads in Milton Keynes are better at this. Wow... breathtaking street.... It definatly works as an urban lung, absorbing all the particles in the air, cooling down the temperatures in summer, and provides a great and confortable jogging or ride on a bike. And ultimately shelter to some animals. I love it. It's not beautiful. But it would be if there were no cars on it. 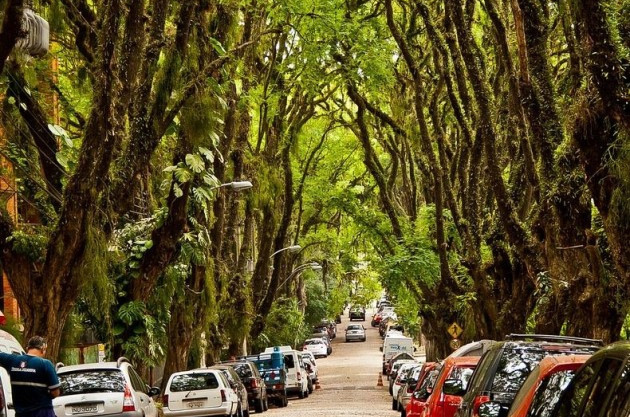 The Tipuana trees along Rua Gonçalo de Carvalho were planted in the 1930's and they have grown into a shady neighborhood canopy for the past 70 years. In 2005, construction of a mall in the area threatened the destruction of the trees. Residents protested, and they were successful in lobbying mayor José Fogaça to declare the area a cultural site that has to be preserved. The trees on Rua Gonçalo de Carvalho create a dense shaded area. From above, it looks as if a forest has filled in between all of the neighboring buildings. The google map view, seen here, gives a perspective of just how isolated this small stretch of nature if among the skyscrapers and commercial buildings of Porto Alegre. Tipuana trees, also known as Rosewood, are native to South America and can grow to be upwards of 100 feet tall. Their extensive root systems can be known to damage streets, sidewalks and nearby homes, but special trenching can prevent this. When in bloom, they have lovely yellow flowers. A post in The Green Shade named Rua Gonçalo de Carvalho the most beautiful street in the world. Blogger Pedro Nuno Teixeira Santos says that this is not just for its aesthetics, but because of its importance to the city: "It was from this love and this struggle of the residents of Goncalo de Carvalho, that the political power of the city found itself forced to recognize the importance of cultural heritage, landscape and environment, classifying and protecting it with the force of law."